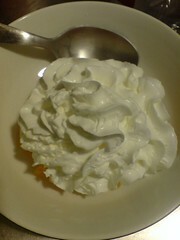 Dessert is a problem, specially if you don’t want to gain too much weight. And if you don’t want to actually cook anything. Otherwise consuming a 1 pound bag of peanut M&M’s is the easiest solution to late night dessert requirements, but past the age of 19 no one can get away with consuming a pound of candy in one night. Fruit’s always good for you but if you live alone, it’s difficult to store fruit. So the best solution is canned fruit. Since weight is also a state of mind, if you buy things that say “Light,” ergo, they and you will be lighter, if not physically, then psychologically, and after all, maintaining morale is half the battle. 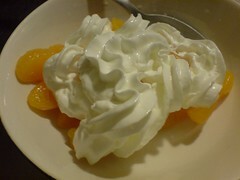 This recipe is full of light ingredients -fruit in light syrup and light whipped cream (or whipped dairy product). I’d even say this is a health food recipe! 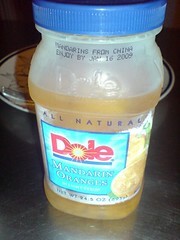 I don’t know if this brand’s better than any other canned Mandarin Oranges brand, but I enjoy reading what it says: “Mandarins from China, Enjoy y [date]”. It says it’s light so it has to be healthy, non? 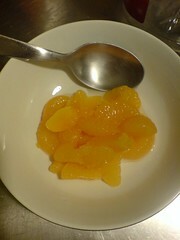 Spoon the Mandarin Oranges out of their container, trying not to include any syrup. When you have placed the right amount, proceed to step two. 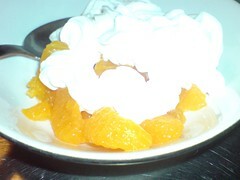 Cover the Mandarin Oranges with whipped cream. You are way better off than having consumed one pound of Peanut M&M’s! This entry was posted in Food and tagged recipes. Bookmark the permalink. Are you sure it is only slightly sinful? In any case: finally! 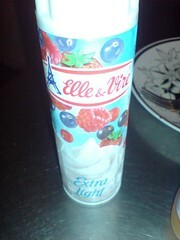 Something that can force me to eat fruits! For a bachelor you prepare food with much oomph! Hey that looks good! Buy also frozen strawberries from the grocery. For variety. 😀 And I like those Dole fruits. I always have a bottle of sliced peaches in my ref! Hi, Toni, thanks for dropping by.